At the invitation of Premier Li Keqiang of the State Council, Prime Minister Jacinda Ardern of New Zealand will pay an official visit to China from March 31 to April 1. At the invitation of State Councilor and Foreign Minister Wang Yi, Foreign Minister Damdin Tsogtbaatar of Mongolia will pay an official visit to China from March 31 to April 2. Q: It is reported that US Special Representative for North Korea Stephen Biegun arrived in Beijing yesterday. Will he meet with Special Representative of the Chinese Government on the Korean Peninsula Affairs Kong Xuanyou and talk about the Korean Peninsula nuclear issue? A: The Chinese side maintains close communication and contact with all relevant parties on the Korean Peninsula issue. Information on important exchanges will always be released in a timely manner. Follow-up: Some DPRK officials have returned to the joint liaison office with the ROK in Kaesong today. What is your comment? A: We support the DPRK and the ROK in enhancing mutual trust and improving ties through dialogue and consultation. Meanwhile, we hope that all parties concerned will work together to sustain the current momentum of amelioration, continue engagement, and work together to promote denuclearization and the establishment of a peace mechanism on the peninsula. Q: A US warship and a US Coast Guard ship sailed through Taiwan Strait yesterday. What is your reaction to that? A: China has paid close attention to and monitored from start to end the passage of the US military vessels through the Taiwan Strait. We have made representations to the US side. 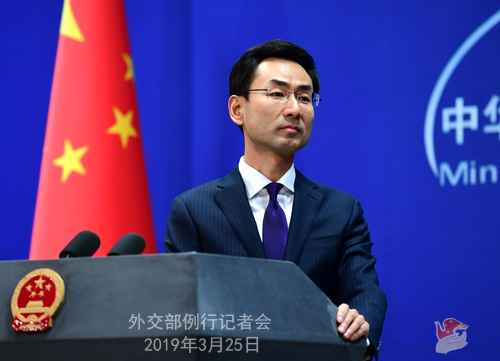 We urge the US to strictly abide by the one-China principle and the three China-US joint communiques, prudently and properly handle Taiwan-related issues, and avoid damaging China-US relations and cross-straits peace and stability. Q: Recently the Pakistani Prime Minister Imran Khan said on social media that he received a message of greetings for Pakistan's National Day from his Indian counterpart Narendra Modi, and he welcomed that. Do you have any comment on it? A: China has noted relevant reports and welcomes the exchange of goodwill between the two leaders. China supports India and Pakistan in continuing contact and dialogue to restore stability, resolve differences and improve relations. China will continue to play a constructive role to this end. 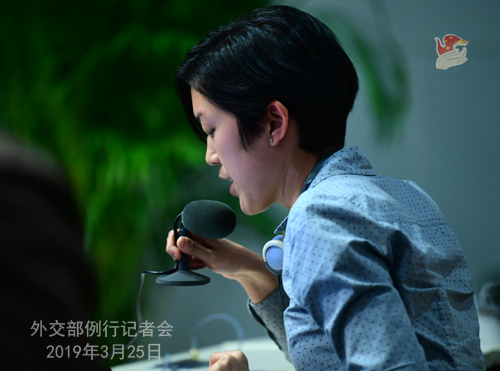 Q: Can you tell us about the Foreign Ministry's discussion with the Europeans about inviting them to Xinjiang? Can you tell us when you would hope to take the European ambassadors to visit Xinjiang? Can you give us any details about the discussions with them and what you've told the Europeans and what kind of trip you are offering to take them on? A: I responded to similar questions last week. As far as I know, discussions are still going on at the moment. Q: You just mentioned the New Zealand Prime Minister will be visiting China. I was wondering if you could give any details about the topics she plans to discuss with the Chinese leader and will Huawei be on the agenda? A: This will be Prime Minister Ardern's first visit to China after taking office. During the visit, leaders of the two sides will have an in-depth exchange of views on China-New Zealand relations and other issues of mutual interest. We believe that her visit will contribute to enhancing mutual understanding and mutual trust, expanding exchanges and cooperation in various fields, and lending impetus to the development of the China-New Zealand comprehensive strategic partnership. Q: As we have noted, according to some recent media reports of the ROK, experts said that the root cause of smog is actually related to the use of domestic boilers in the country. There are boilers being used in 3.6 million Korean families, and winter is the peak season, which is why blaming China for the smog in the ROK is not well grounded. I wonder what is your response to those reports? Is there any cooperation project between China and the ROK on smog control? A: We have taken note of relevant reports. Those remarks by Korean experts you mentioned are reasonable and objective. 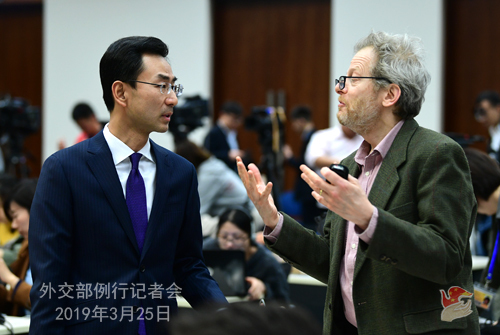 Chinese authorities for environmental protection and leading experts have given professional and thorough explanations on whether China's air pollution affects the ROK. Here I won't repeat what they said as such information is readily available online. In response to your question, environmental cooperation has always been an important part of China-ROK cooperation. Our environment ministries, after in-depth exchanges, signed a working plan on advancing the prevention and control of air pollution and the construction of an environmental cooperation center. The Chinese Research Academy of Environmental Sciences and the Korea Environmental Industry & Technology Institute established a working group to conduct joint research and analysis on air quality in the two countries. To achieve our own development, we will accelerate efforts to treat air pollution and secure a decisive victory in fighting smog to keep the sky blue. At the same time, we will work with the ROK to enhance communication and cooperation in air quality, find solutions to the smog issue, and contribute to better environment in our countries and the sustainable development of the region and beyond. Q: A US official has criticized China for taking "highly choreographed tours" to Xinjiang, saying that this did not accurately reflect what is actually going on. The official also criticized China for carrying out "highly repressive" policies in Xinjiang. What's you response to this? A: To give the international community a better idea of the economic and social development of Xinjiang, China has invited foreign diplomats and media reporters from many countries to visit this region. After a first-hand experience of the real Xinjiang where people of various ethnic groups live happily in tranquility and prosperity, many spoke highly of China's Xinjiang policy. Their remarks were also covered by media. The criticism of the US official you mentioned is not based on facts at all. It is pure rumor and denigration. I'd like to reiterate that people in Xinjiang are living a happy and fulfilling life with political stability, economic vitality and social harmony. We firmly oppose the US attempt to use Xinjiang-related issues as a pretext to interfere in China's internal affairs. Q: At last week's press conference, you said that President Xi Jinping has sent messages of condolences to his counterparts in Mozambique, Malawi and Zimbabwe which were hit by the tropical cyclone. You also mentioned that the Chinese government has offered emergency humanitarian assistance to the three governments and stands ready to provide more support in light of the needs of relevant countries. Do you have any updates for us? A: You may have already noticed that China's Ministry of Emergency Management has released information on this. At the request of the government of Mozambique, the Chinese government dispatched a rescue team to Mozambique. According to my information, the rescue team arrived in the affected area on the morning of March 25 local time with supplies for disaster relief and assistance. They will provide search and rescue support and medical and epidemic prevention assistance for the local rescue efforts. We believe that with the help of various parties, people in the cyclone-hit areas in Mozambique will soon rebuild their homes. Q: Regarding India and Pakistan, you just mentioned that China is willing to play a constructive role in easing the tensions between the two countries. Earlier, China had also stated that it is willing to mediate between India and Pakistan. Do your remarks today show any evolution in China's position on India and Pakistan? A: China's position is consistent and clear. India and Pakistan are both important countries in South Asia. We hope they will have a friendly and cooperative relationship and properly resolve outstanding issues in bilateral relations through dialogue and consultation. 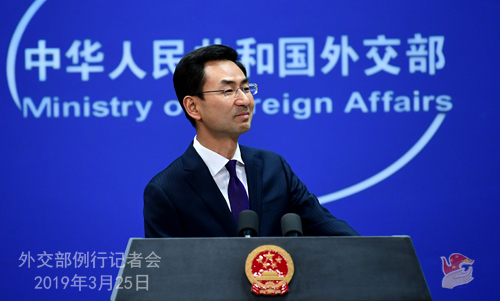 China would like to maintain friendly relations with both countries and stands ready to play a constructive role in facilitating dialogue and cooperation between them.